Today is going to your first introduction to proper organization on your website. One thing that we always need to remember is that we are building our websites for PEOPLE, and our visitors and how someone would view our content and our navigation is what should dictate how we present our content. 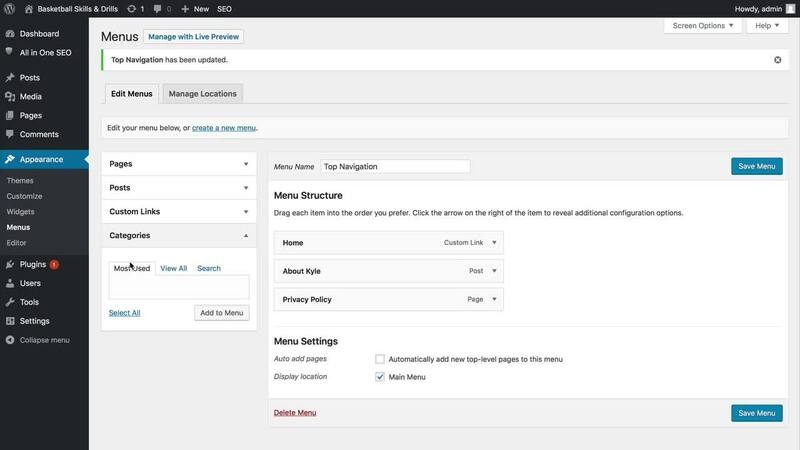 Introducing "Custom" Menus in Wordpress. The default Wordpress menus work in very strange ways and can be quite awkward. Typically when you add a page, it automatically goes to the main menu. A post, will go to the homepage blog roll (not the main menu). As a website owner, you want FULL control of your navigation as your theme by default won't do a very good job of this. Fortunately, it is quite straightforward to create Custom Menus. Navigation is going to be a critical element to your user experience moving forward and will impact your rankings (as Google ranks sites with proper navigation better), so this is an important step here. I have created a video walking you through the process of creating custom menus. You can check it out below. There are a few simple steps to creating a custom menu. 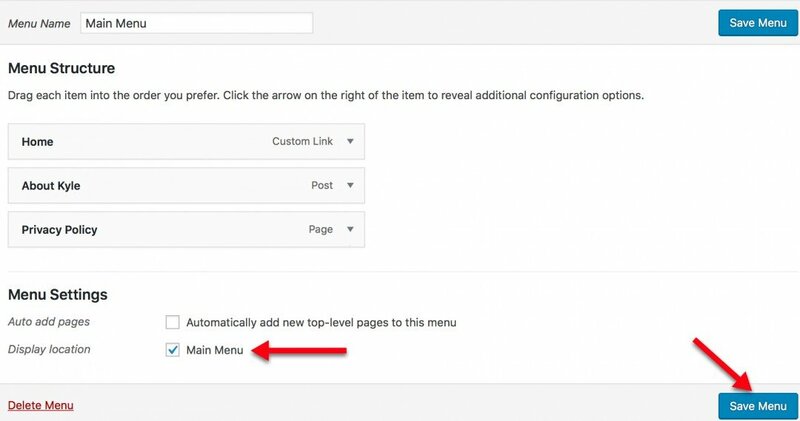 The first thing you need to understand is where to find the Menu management section within your Wordpress admin area. Under the Appearance, click the Menus sub heading. This will take you to the custom menu creator. Under the left tab, you are going to see a Posts section. Posts are not added to your navigation by default, so you are going to need to click the Posts tab and it will show a list of your Posts. In this case, we have only create the About Me post. 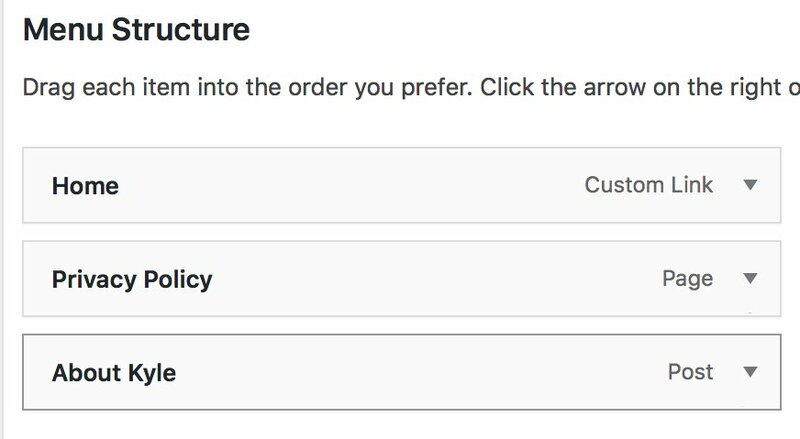 Click the check box associated with that, and then click the Add to Menu. Your About Me page has now been added to your menu structure (as shown below). Under Menu Settings, I am also going to make the "Display" location, Main Menu. Check this box as this will put this menu as your main navigation at the top of your page. Upon doing this, click the "Save Menu" button and you are set. For example purposes, here is what my live website looks like with my newly updated menu. And we are done. It is as simple as that and as we continue to build out our website, we are going to be reorganizing our websites regularly, managing this menu and likely creating "sub menus" which we will be getting into later as we have more content on our websites.